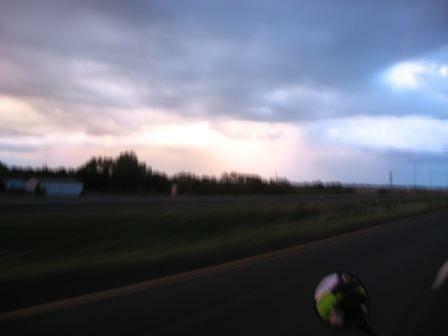 July 28, 2010: The scariest rain I’ve ever ridden through was on I-90 in South Dakota. We were heading home after seeing Theodore Roosevelt National Park in North Dakota and a ride to Mount Rushmore and the Badlands. We’d encountered heavy rain outbound through Milwaukee but the weather was pretty good otherwise. We had omens, which I did not pick up on. In Presho we stop to refuel and a 300-lb. farmer in overalls and a green cap holds Linda hostage with a story of a world-record hailstone from a storm in Vivian, about 14 miles west. We’d seen the story on the Weather Channel that morning. Weather reports call for scattered thunderstorms and we have a motel reservation in Canistota, about 150 miles away. “It’ll be dark when we get there but we should be okay,” I tell Linda. Clouds start building up to the northeast of us not long after leaving. They get darker and bigger and more impressive and I realize we’re probably on a collision course. But 90 veers a little to the south and I think maybe we’ll miss it. Around Chamberlain dark cloud formations change and an impressive column of white starts spreading in the distance. It reaches from the sky to the ground and looks like it’s a couple miles wide. I can hardly keep my eyes off it. Nearly every motorcycle rider travels in rain. You’ll hit it sometime, the only way not to is to stay home. The solution is to expect it and suit up accordingly (which we are), try not to stay too long in it, and know when to bail out. It gets worse after Plankinton, seriously worse, an absolute downpour that reminds me of an ocean storm I encountered once on Cape Cod. The winds pick up and start pushing us all over the road. Then we hit highway construction and eastbound traffic is merged into the westbound lanes, a single lane for each and now we’re buffeted by oncoming trucks rushing past a few yards away. To top it off, the pavement has those stupid rain grooves that have the front tire skittering around, seeking purchase. I ease off on the throttle and shift down. At this point, I realize I’ve gone too far, that we should not be out in this, and I admit to myself I’m scared. My helmet visor is misting over and I have to crack it open slightly, which lets in cold stinging rain. My arms ache from wrestling with the handlebars. We’re canting into the wind but the air blasts from the trucks literally stand us upright and we keep pitching back and forth like that until I’m convinced we’re going to get blown over. It’s time to abort. But there’s no exit and no place to pull over. We have to keep going for a few teeth-gritting miles until the next ramp, some place called Mount Vernon. We get to the top of the ramp and find a rural road with nothing on it. Off to the left I see lights in the distance and head for that. It turns out to be a gas station/convenience store, an oasis of light in an ocean of darkness. I pull the bike under the overhang and park between the gas pumps. We shakily climb off and squish inside. The woman is an incredibly kind soul who lets us put sopping helmets and gloves on a glass counter and says we can stay as long as we like. She’s supposed to close at 10, but keeps the store open and tells us not to worry. We buy hot tea and stop shivering after a while. Eventually the rain lets up and I refuel. We reach Canistota about an hour later, peel off the riding suits and collapse.